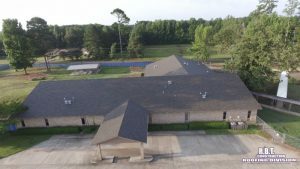 We Repair and Install Commercial Roof Shingles in Texarkana, TX. If you are looking for a high-quality roofing system for your sloped commercial roofing, look no further than roof shingles. While roofing shingles are usually seen as a residential roofing material, they are also a great commercial roofing material. Not only can this type of material last for 20 years or more, it is also very versatile and affordable. At R.B.T Construction Roofing Division we are proud to offer repair and installation service for roof shingles in the Texarkana, TX area. 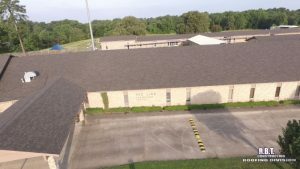 If this is a type of commercial roofing you would be interested, please call our roofers today at 903-691-0931. There Are Many Benefits To Getting Roof Shingles for Your Commercial Property. There are a ton of commercial roofing materials on the market today, so why should you choose shingle roofing for your commercial property? There are several reasons why shingle roofing is an excellent choice for any type of sloped roof. Colors and Shapes: If you are wanting a red roof for your building or you are looking for a more unique shingle shape, you are able to get that with shingle roofing. Very Durable: One of the great things about commercial shingles is how resistant they are to certain weather and disasters. They are able to withstand fire, wind, and even hail. Affordable: A huge selling point for roof shingles is that they are really affordable. You not only get an aesthetically pleasing roof but within your budget. Easy Maintenance: This type of roof is also great because maintenance, repairs, and even installation service are very easy. To get more information about roof shingles for your Texarkana, TX property, call our office. At R.B.T Construction Roofing Division we believe in offering quality products as well as services. We work with some of the best suppliers such as Owens Corning and Berridge to provide you with the best shingle roofing for your building. We can either install or repair fiberglass composites or metal shingles. No matter what type of look you want or kind of protection you want, we are able to help you find the best roof shingles in Texarkana, TX. Get in touch with us today by calling 903-691-0931. Updated on August 31, 2018 at 11:54 am by R.B.T. Construction Roofing Division.